Dynamic variables compute their own values by executing statements and logical expressions. A dynamic variable assigns itself the result of a calculation or operation. 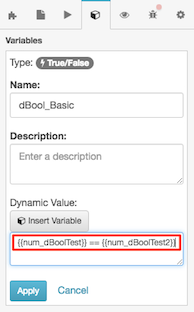 The dynamic variable types are dynamic string, dynamic number, and dynamic True/False (Boolean). In this example, a dynamic Boolean variable returns true if numeric inputs match or false if they don’t match. 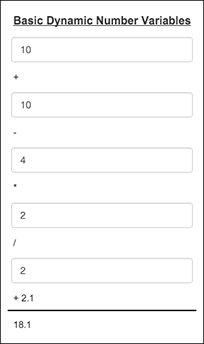 In design mode, the page shows two numeric inputs whose values are stored in numeric variables. Code in a dynamic Boolean compares them for equality. 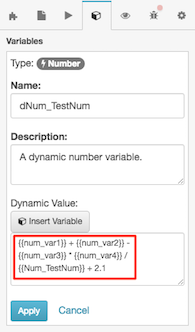 In the next two examples, dynamic string variables parse and rewrite user input. 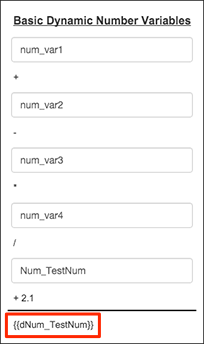 An expression in the dStr_Exp variable rewrites text typed by the user to “This is fun.” An expression in dStr_Test inverts case when a check box changes state.